Supporting Parent Training helps prepare you to help new families that have a child diagnosed. We try to provide each new family as supporting parent to talk to that has had a child with a similar treatment plan to what they are facing. We prefer that parents attend this training before they are assigned. If you are caring for a child with cancer you need a Care Notebook!. Individuals and families get information and paperwork from many sources. Participants of this workshop are provided tools to organize their most important information in a central place, making it easier for them to find and share key information with others who are part of their loved one’s care team. Caregivers will benefit from this workshop as they receive all documents to maintain care notebooks on a CD to take home for future updating. Please contact Lora at lora-roberts@oklahomafamilynetwork.org or 918-227-1797 if you are interested in attending either or both training sessions. 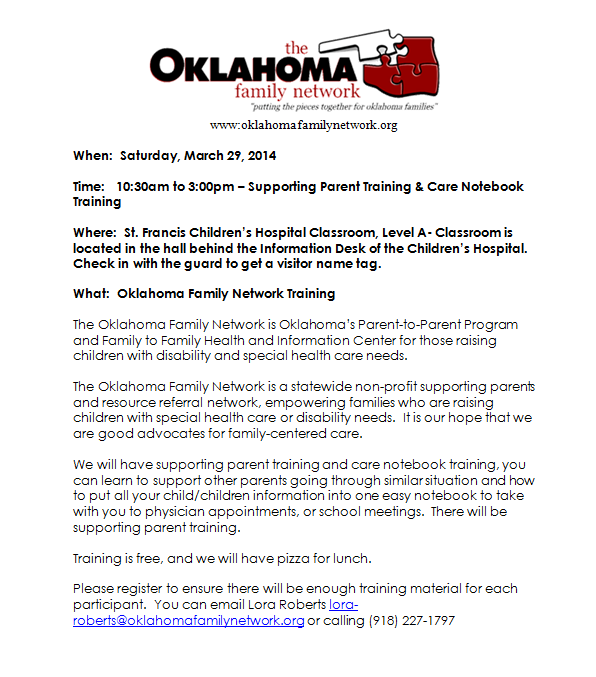 More information about these and other OFN trainings can be found on the Oklahoma Family Network website. The Importance of Family Leadership and How to get Connected – You will learn why effective family leadership and building relationships with other families and professionals can make a difference in the life of your loved ones with special healthcare needs and how you can ensure that they are receiving the services they need. Your Experience is Important – Learn to Share on Boards & Committees – Have you ever asked yourself, “Am I ready to serve on a board or committee?” In this session you will learn the basics about the different types of boards and committees, the “does” and “don’ts” of serving and more importantly, why your voice of experience is needed. member so that he or she is receiving the services that best meet his or her needs. Family/Professional Partnerships – Legislative Advocacy – Whether it is your loved one’s principal or a legislator, building relationships takes time. The presenters will talk about the importance of getting to know the people who have the power to make and change policy at the local and state level. *Lunch cannot be guaranteed for registrations received after June 12, 2013. Check in with the guard to get a visitor badge. The Oklahoma Family Network is Oklahoma’s Parent-to-Parent Program and Family to Family Health and Information Center for those raising children with disability and special health care needs. The Oklahoma Family Network is a statewide non-profit supporting parents and resource referral network, empowering families who are raising children with special health care or disability needs. It is our hope that we are good advocates for family-centered care. There will be a Care Notebook Training where you can learn how to put all your child/children’s information into one easy notebook to take with you to physician appointments, or school meetings. There will be Supporting Parent Training if you are interested in being a supporting parent for the Oklahoma Family Network. Many of us with children need the support of someone who has “been there, done that.” The goal of this training is to build a statewide network of family members who can appropriately support those who are just starting out (or those who are not as far along in the path) in raising a child with a special need. Training is free, but please register to ensure there will be enough training material for each participant.